What were you doing in March 1978? I was reading my favorite Ham Radio magazine issue of all time. 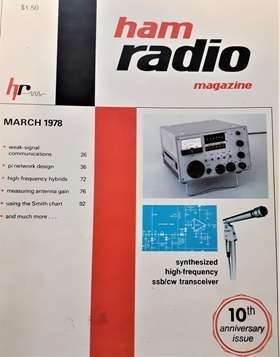 March 1978 signaled the tenth anniversary of Ham Radio magazine. Editor Jim Fisk, W1HR really outdid himself with this one. You may recall some of the great contributors to this magazine like Ulrich Rohde DJ2LR, Leonard Anderson, Don Nelson WB2EGZ, Walter Jung, and Henry S. Keen W5TRS. They all showed up in this magnificent issue. Leading the way was Ulrich Rohde with his Synthesized High Frequency Transceiver. Now, this was something entirely new for me. My first exposure to the concept of up-conversion general coverage receiver using a first IF above the tuning range. What’s more, you found exposure to high level double balanced mixers, digital frequency synthesis, integrated circuits and optical encoders. From the 1980’s to until recently, this new receiver design became the benchmark and something we all took for granted before direct sampling came along. Many manufacturers have produced ham radio gear with a VHF crystal filter in the first IF and 9 MHz filter second IF. Over time, the price and performance of digital synthesizers and frequency displays improved dramatically. Over the years, I must have read this article hundreds of times. I even have three copies of my favorite Ham Radio magazine issue stored in the basement. I am sure that this article sent many radio designers back to the drawing boards. You might want to read this article for yourself. You will also find seminal articles about operational amplifiers written by Don Nelson and Walter Jung. These are still relevant today. A great introduction to how op amps work and how to use them. Other great “how to” information focused on Pi-network design and using the Smith Chart for transmission line calculations. The late 1970’s and early 1980’s were a great era for electronics experimenters. Lot’s of new technologies that were actually accessible to hobbyists And of course you found newly emerging microcomputers everywhere. If you still have boxes of old radio magazines in the basement, open them up and read your old favorites. In March 1978, my favorite Ham Radio magazine issue of all time got me going in my enduring interest in receiver design.